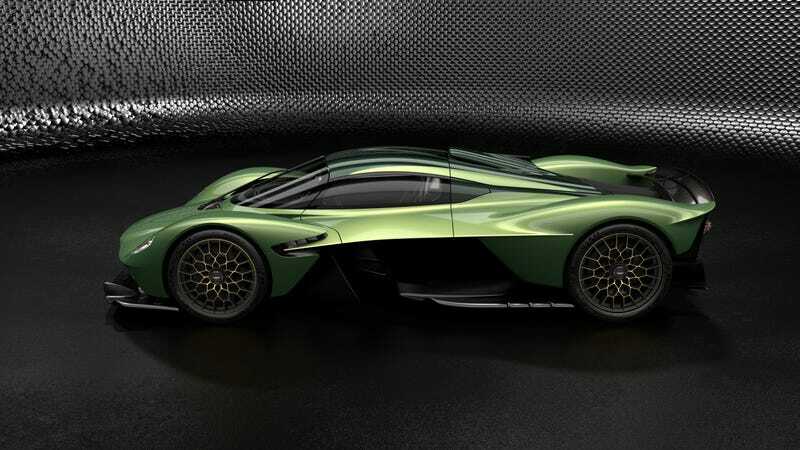 As if you needed more reason to jack up the price of the 1,000-plus horsepower, $3.2 million Aston Martin Valkyrie, it turns out you can also option it out with actual gold. I guess this is a good exercise in investing in precious metals? ‘Q by Aston Martin’ offers many exquisite personalisation options, including the indulgent Gold Pack which features a 24-carat gold leaf livery that is meticulously laid under the paint lacquer. 24-carat gold! That’s way better than the cheap crap we saw on a 14-carat gold-plated Lamborghini Countach from a few years back. Look at it this way: When the world inevitably ends and we get blasted back to a society that relies on precious metals as currency, your Valkyrie will be worthless unless you got it with the gold option. If you had such clever foresight, you’d simply need to scrape the gold from the paint and be able to buy yourself some of that maggoty bread. It would truly be the car that kept on giving. Either that, or just get a Mitsubishi Pajero Evolution as something you can actually use to drive across the vast, empty wastes with. Anyway, the 150 lucky people who will get Valkyries will be able to fit them with a whole bunch of other options, including something called the “AMR Track Performance Pack” that includes track-only components that you can swap with existing road-legal ones. These are said to be able to get the Valkyrie to set an eight-percent quicker lap time. A whole eight percent! A new front clam (confusingly, yes, a clam) gives you more downforce and there’s a second set of exterior body panels, titanium brakes, track suspension, magnesium performance wheel and a carbon fiber aero-disk set, too. You can also include a “suite of personalised pit garage and race suit accessory options to their package, providing owners with the ultimate track day and hypercar ownership experience.” I have no idea how much this option will cost, but it’s probably the price of an entire other Aston Martin road car. Of course, there’s also paint. The four paint schemes are Slipstream Green, Liquid Petroleum, Ethanol Silver and Maximum Orange; though, if you really wanted to, I’m sure you could get Jigglypuff painted on your Valkyrie because money. Inside, buyers can customize the cabin from a set of Alcantara colors, patterns and finishes, along with bright seat harness hues. There’s nothing I love more than a bright seatbelt, so I approve of this option. I’m officially putting out a dare to any Valkyrie owner to customize their car in the most lurid, clashing and insane way possible. Everyone expects these things to be serious. Make Aston Martin paint a meme on yours or something. Be creative. You can definitely afford it.